MANILA, Philippines - The last ticket to Rio Olympics 2016 will be given tonight, July 10, as the 2016 FIBA Olympic Qualifying Tournament (OQT) Finals is set between Canada and France. Who will join Serbia and Croatia as the OQT qualifiers? Find out the through livestream video on this page. Both Canada and France are undefeated in the OQT Manila, and it will surely be very exciting to see which team emerges triumphant in making it to the Olympics. 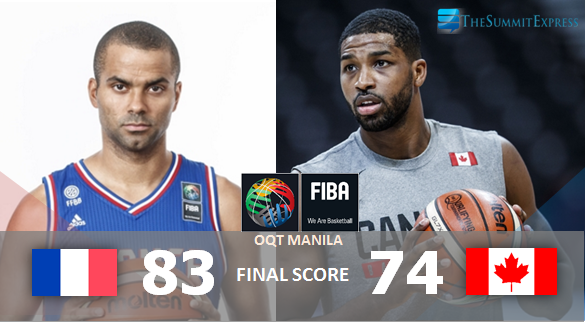 UPDATE: France is #FIBAOQT Manila champion! It will also be a battle of talent-laden squads as both the Road Warriors and Les Bleus are stacked with NBA players. Cory Joseph, Tristan Thompson and Anthony Bennett are expected to lead Canada in this titanic tussle, while Tony Parker, Boris Diaw and Nicolas Batum are expected to be the big players for France. On Saturday, France defeated Turkey, 75-63 due to its efficient shooting. As a team, the French made 52% of their field goals, including netting 7 triples. Meanwhile, Canada has entered Finals after they outlasted a gritty New Zealand, 78-72. TV5, which has previously broadcast the 2013 FIBA Asia Championship, will have exclusive coverage of one of the three tournaments that will decide the remaining three places for the Olympic Basketball Tournament at the Rio 2016 Olympic Games.